When it comes to keeping your Tripawd strong and injury free, Tripawds members have such great insight to share. 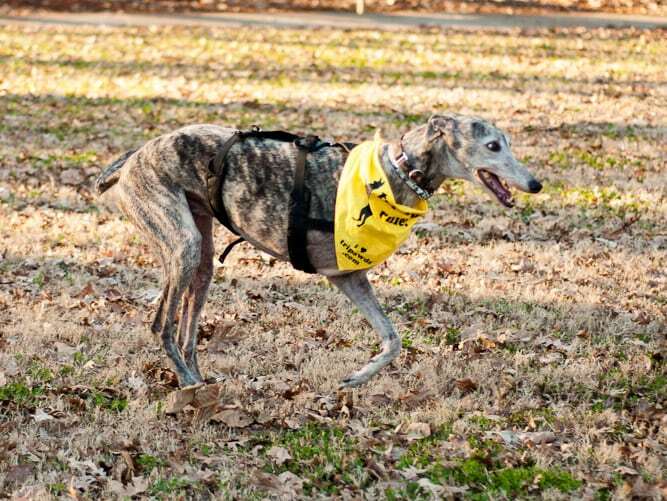 Take for instance Ingrid, dog mom to greyhounds galore, including one of the sweetest pups to ever join us here, Angel Nixon. “The number one thing you want to condition is the abdominal muscles. Weight shifting exercise is great. Stand behind her and place your hands on either hip. Gently sway her hips to one side and then the other. Just enough until you feel her have to compensate for the shift. it is a small movement. Next, add front to back. Stand facing her side that is missing the limb. Place one hand on her chest and one hand between her tush and her hocks. Rock front to back. Again very gently and repeat 5 times front and back. Very quickly, you’ll work up to 10 times in each direction. These take no time and you’ll find most dogs enjoy it once they learn what is expected of them. And then there are cookie crunches. Take a high value treat and while she standing, without moving her feet, have her turn her head towards her tail on both sides. Reward the slightest try. many dogs don’t like doing this at first but it helps a lot. Once they realize they can do it, they start doing it on their own. Also practice this while laying down on a firm surface. Do 3 to 5 in a row on each side. Again, work up to 10. That may take some time. With a dog as large as yours, I’d say make each circle about 10 feet in diameter and then work your way down to 4 or 5 feet. Don’t overdue it but just 1 minutes of this once or twice a day will really help with balance and strength. 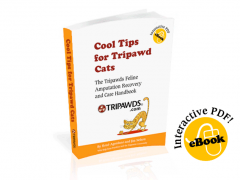 Do you have Tripawd dog or cat fitness tips that you’d like to share? We’d love to hear them! Ah! You are so right Michelle, thanks for that reminder. Great questions Catgirl! We strongly encourage you to consult with a certifies rehab vet tech. 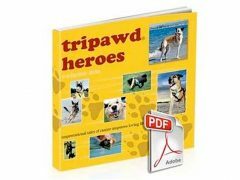 As a Tripawds member, The Tripawds Foundation may even reimburse you for your first visit through the Maggie Moo Fund for Tripawd Rehab. Okay, I laughed at the cookie crunches. Sadie has a tendency to try to sleep with her head turned back towards her rump, resting on her ribs. Never looked very comfy to me, but I guess she’s getting something out of it. Hi do you have a video of the hip swaying ? ?